Adam Blythe opened his season with new team Tinkoff today at the People’s Choice Classic armed with a renewed sense of motivation that helped power the Yorkshireman to third place. Blythe spearheaded Tinkoff’s assault at the Tour Down Under prelude criterium in Adelaide, South Australia finishing third behind winner Caleb Ewan (Orica-GreenEdge) and Giacomo Nizzolo (Trek-Segafredo). 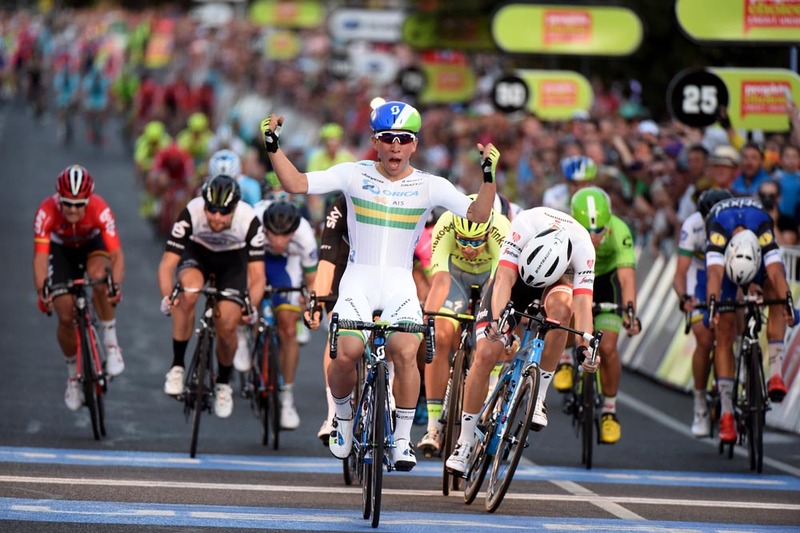 The 26-year-old last year supported Ewan in races for Orica-GreenEdge but found himself sprinting against the Australian on a city circuit. Blythe has only one compatriot in sports director Sean Yates at the team but appears to be making a seamless transition. “We had a good training camp in December in Gran Canaria,” Blythe said. A relaxed Blythe arrived in Australia with an international cast of team-mates on January 4 and has taken advantage of fine training weather before the official start of the WorldTour season on Tuesday. “We sat at a coffee shop the other day and we all realised we’re all from different countries. Everyone on the table is from somewhere different but we all get on well,” he said. Blythe joins Tinkoff with the main aim of supporting world champion Peter Sagan through the spring classics up until Paris-Roubaix. “Hopefully I’ll be in good condition and I can look after him as long as I can,” he said. “I’ve got to see how I’m going I guess. I’ll say at the moment the first 20km I’ll help him and depending on my form after that! “It will be a similar thing to what I’ve done in the past when I was with Lotto, trying to take care of [Philippe] Gilbert and keep him out of the wind as long as possible.